Carlos and Bertha were fantastic to work with. They flew out to our California office on a moment’s notice and took the time to make sure all parties fully understood how employment law works. Thanks to their extensive experience in employment law they were able to make a tense situation easier for all involved. You were all great. I appreciate your hard work and family atmosphere! Thank you for your professionalism, expertise and knowledge. Your firm made a stressful time more bearable. I will always be indebted to all of you. Thank you so much for answering my call last night you didn’t have to since you were already off work but I really, really appreciate it. These last two years or so have been hell but God has definitely blessed me with you and your wife. God Bless your family and your firm for being a light at the end of a tunnel. The attorneys and staff at Burruezo & Burruezo made me feel like family. I was treated with dignity and respect at every encounter and the whole team was courteous and professional. This firm comes highly recommended. B&B law firm treated me like family. The staff is compassionate, friendly and were always professional. I never felt like a case number and was kept up to date on the progress of my case. Bertha, Carlos and their associates go above and beyond the call of duty to ensue justice. Burruezo & Burruezo are second to none. 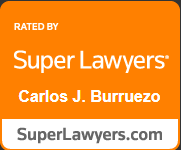 The attorneys at Burruezo and Burruezo Law Firm are incredible. When I had some problems with my employer, Bertha was there for me on a short notice after the EEOC had called me. What’s great about this law firm is that the people really care about you, personally, and not just your case. They have proven to be tenacious on my behalf. They always took my phone calls, and often called me before I could call them. I highly recommend this law firm to everyone who has, or thinks they may have, an employment or discrimination issue. They’re the greatest! – Lidia and Thomas G.
Bertha has done a phenomenal job working with our company in many different employment cases. With over 2,000 employees we had to deal with EEOC cases, worker’s compensation and unemployment. We never had a case unsolved or lost. Bertha also did a great job negotiating with the states regarding Employment taxes in the past. She helped us reduce penalties, negotiate payments, etc. We are very fortunate to work with Bertha. Bertha, thank you again for your help and advice. It was and is truly appreciated! Hopefully we can catch up some time in 2016 and chat law & yoga. Wishing you a healthy and prosperous New Year! Words are not enough to express my sincerest gratitude for your support & legal expertise throughout a difficult span of time. Carlos, Bertha, Chris, Vanessa, Ivette & Carmen your words of encouragement during each encounter helped lift my spirits. I will never hesitate to refer clients who need your dedication & expertise. Thank you. You’re appreciated more than you’ll ever know. Thank you for doing such a great job! I so appreciate your hard work, patience and diligence in my case!